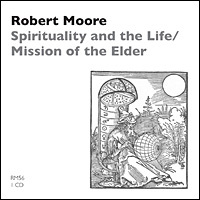 In this program Dr. Moore presents the issue of the central/foundational role of the deep study and living practice of spiritual wisdom in the life and mission of the elder. Without this life after 55 and the aging process becomes a fertile incubator for resignation, depression, despair, and increasing narcissism. This program is the second presention by Dr. Robert Moore at the 2011 USA Gathering of Elders at the Wesley Woods Camp and Retreat Center outside Indianola, Iowa. Dr. Moore’s keynote address, MKP Eldership in 2012: The Challenge of a New Consciousness in Leaders During and After the Apocalypse (RM55).